KATHMANDU: Stocks opened the week on a strong note and maintained a positive bias for the initial trading hour on Sunday. However, the benchmark Nepal Stock Exchange (Nepse) index failed to hold to the gains and pulled back mid-day to close slightly lower. 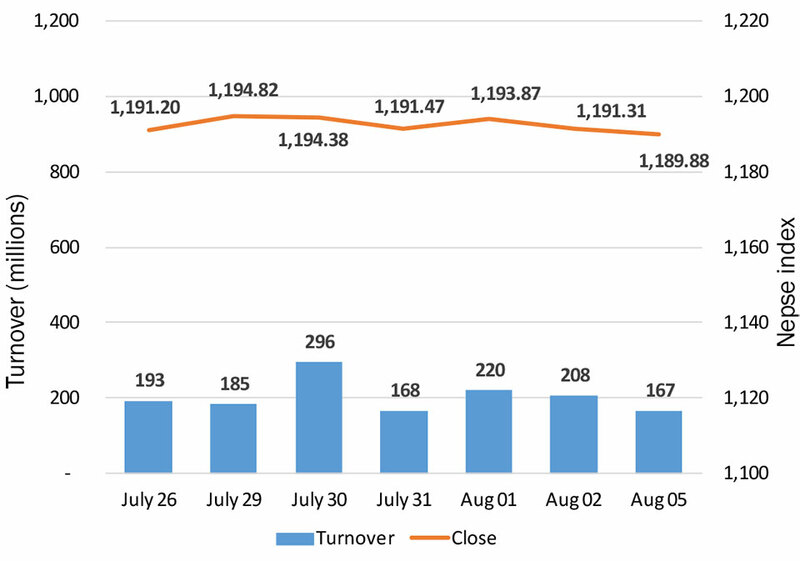 At the end, Nepse dropped 1.43 points to close at 1,189.88 points. 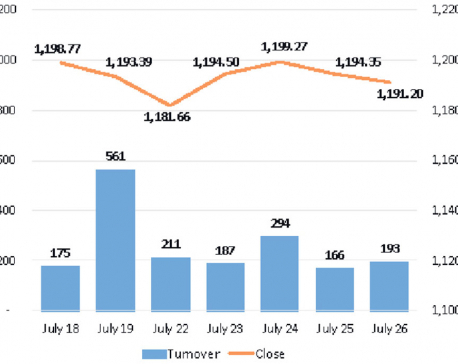 Market activity has slowed down further with the decline in the index. Investors are yet to come out of the cautious stance which they have been maintaining since the start of the Fiscal Year 2018/19. Most of the listed companies are yet to publish their year-end earnings reports which might also be contributing to the insipid sessions seen lately. 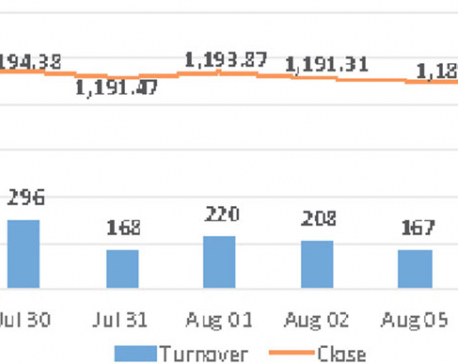 On Sunday, just over Rs 167 million worth of shares were traded in the secondary market. Sectoral indices also reflect the broader market, posting in slight movements on either side of the spectrum. 'Others' sub-index posted the highest gain of 0.92 percent followed by Development Bank sub-index which closed higher by 0.79 percent. Sub-indices of Hotels, Life Insurance and Microfinance groups edged slightly higher. Meanwhile, Manufacturing & Processing stocks were under pressure on the day as its sub-index fell 0.91 percent. Non-life Insurance index also slid 0.53 percent. Similarly, sub-indices of Hydropower, Banking and Finance groups also closed the day's trading in red. Sanima Mai Hydropower Ltd led the list of active stocks, as Rs 8 million worth of its shares changed hands on the day. Mahuli Samudayik Laghubitta Bittiya Sanstha Ltd was also actively traded after the company published its year-end financial reporting posting a 61.83 percent drop in net profit year-on-year. The bank posted net profit of Rs 14.78 million as per its unaudited report. Private sector lenders like Everest Bank Ltd, Nabil Bank Ltd and Standard Chartered Bank followed recorded turnovers of Rs 7 million, Rs 5 million and Rs 4 million, respectively. City Express Finance Co Ltd led the list of gaining sides. Share price of City Express, which was down 38 percent last week, retraced almost 10 percent on Sunday. Meanwhile, RMDC Laghubitta Bittiya Sanstha Ltd and Mahalakshmi Bikas Bank Ltd added around 4 percent each on their share price. Similarly, unit price of NMB Sulav Investment Fund -1, Khanikhola Hydropower Co. Ltd and Om Development Bank Ltd also rose over 2 percent each. On the contrary, shares of IME General Insurance Ltd and Progressive Finance Ltd tumbled over 5 percent each. Securities including Rairang Hydropower Development Company Ltd, Mahuli Samudayik Laghubitta Bittiya Sanstha Ltd and Laxmi Value Fund-1 also took a knock, skidding over 3 percent each. On the earning front, Central Finance Ltd published its financial report for the fourth quarter of FY2018/19, posting a modest rise in its net profit to Rs 79.40 million from last year's Rs 78.09 million. Meanwhile, Vijay Laghubitta Bittiya Sanstha Ltd reported a decline of almost 17 percent in its net profit as per its fourth quarter report. Technical analysis by ARKS suggests that the Nepse index is yet to come out of its sluggish movement of late. The market trending below 1,200-point level with dismal activity further enforces the fact. In the present context, the market is likely to prolong its sideways movement.